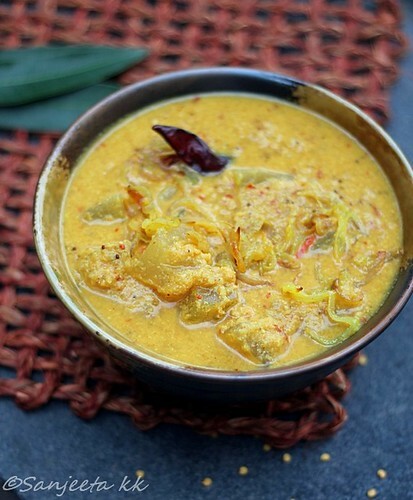 Known as Kuvalyacho Pollav in Konkani, Pumpkin Curry is a typical dish in Mangalore where coconut is used generously. This is a family recipe shared by Henrietta Colaco, a great-granny residing in Bangalore. Like most grandmother recipes, this one also had a tip which required patience – onions and grated coconut are sundried and made into a paste. Mrs. Colaco said that she has seen her mother and grandmother place the grated coconut and sliced onions in hot sun for a day until the moisture completely evaporated. However, as she herself added, modern lifestyle does not favour such elaborate steps in the cooking, hence these days they simply dry-roast them. “It’s just that it has a better flavour when dried in the sun,” she reiterated with a smile. 1. Wash the pumpkin, cut into half, peel and remove the inner pith and seeds. Now chop into 1 inch cubes. Boil with a cup of water and a pinch of salt for 10 minutes until cooked. 3. Now, dry-roast the above coconut and onions along with coriander seeds, red chillies, rice, mustard, cumin and garlic for 7-8 minutes on medium flame. Now add the remaining ingredients and grind into a fine paste using very little water. 4. Add this ground masala along with salt to the pumpkin and cook for 4-5 minutes. Remove from flame and set aside. 5. Heat the ghee in a large wok, add the remaining sliced onions and saute until the onions turn golden and crisp. Add them as garnish to the curry. 6. Check if you need to add some water; the consistency of this dish is neither too thick nor too thin, but gravy-like. You can add a teaspoon of vinegar if you like it more tangy. Enjoy this delicious Pumpkin Curry by serving hot with steamed rice or even rotis. This recipe was first published in The Great Granny Diaries – a column in Harmony Magazine. Part-1 of this post is the interview with Henrietta Colaco, a Christian great-granny from Bangalore.